Having a car can be a necessity for transportation around Europe depending on where you are. If you are looking to travel for a short duration of time, you might want to look into renting a car. We’ve rented many cars and have compiled a helpful list of tips to consider. We follow these religiously to make sure that you get the best deal possible on a car rental. Aviz and Hertz are among the many big national chains for car rentals within the United States. Make the smarter choice and opt for reliable independent agencies including Payless, Sixt, Fox Rent a Car. Because they have lower operating costs, their car rentals can be found at prices up to 30% lower than other mainstream agencies. You can easily find these cars at Web sites including CarRentals.com and CarRentalExpress.com. Spend a little time investigating potential discounts and coupons online. Some popular discount sites including PromotionalCodes.com and CouponWinner.com. You can also do a quick online search of a rental company for coupon codes on Google. If you are a part of frequent flier programs or other organizations rental car companies regularly partner with (like credit card companies), check for discount codes exclusively available to members. Some of these organizations include AA, Michelin, and RAC. Discount codes and coupon codes can often be combined, so make sure you do your research thoroughly. Using websites such as Kayak.com, SkyScanner.net and RentalCars.com will allow you to check for lower rates and coupons until the day of your trip. With the help of the website, you can check prices of rentals at various rental car companies. Once you have decided on one, you can also book your car directly through the website. The website will even throw in any discounts that it can find for you. The only drawback of booking through the website directly is that you will not have as many choices to choose from, simply because the website guarantees car reservation changes and cancellations without penalty, something that car rental companies are not fond of. Airport locations are convenient as well as much more costly. Prices can increase by more than 30%. Consider taking public transportation to a nearby, off-airport location and there’s a high chance you’ll save money. 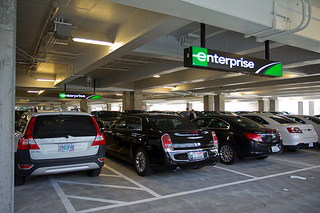 Sometimes, adding a few extra hours or days to your car rental can lower your rate. There is no penalty for returning the car earlier either. This method works because rental companies offer lower costs for the weekends. Play around with reservation dates to check to see if this method will work out for you. Even though the overall estimated cost might be higher with hourly charges, by returning the car earlier, you will be able to secure the lower rate. With all of these tips, you might have already landed yourself with an amazing, low rate. However, you should always take the opportunity and see if you can negotiate for an even lower rate at the rental counter. Sometimes, companies will be more than happy to put in you bigger and less popular vehicles without raising the cost. Discounts are usually offered to customers who are willing to pay in advance. Discounts can go up to 20% for any customers that will pay upfront. You can also try looking on Priceline.com and Hotwire.com. These two websites are known for offering high discounts for travellers that are willing to pay earlier rather than later. Think about it this way. You are going to have to pay the amount in full anyways. By paying earlier, you will be saving yourself a bit of money as well. Don’t forget many credit cards offer points which might also add that extra incentive to prepay.